I decided to spotlight our dinner today instead of our lunch since we've been doing all local food for dinner over the last week. 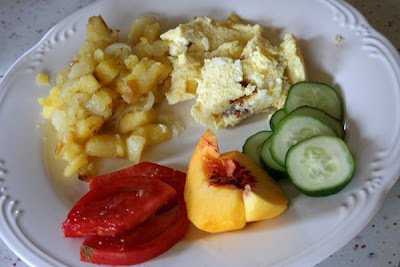 Tonight's dinner was scrambled eggs, pan-fried potatoes and onions, and fresh peaches, tomatoes and cucumbers. 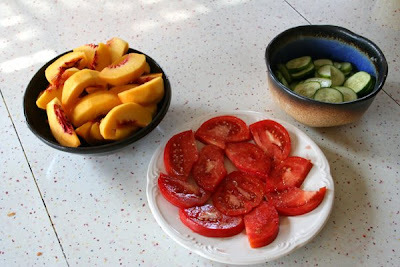 The cucumbers were from our garden, the rest came from the farmer's market just this morning. What I should have shown was the way my kids scarfed down blueberries and cherries...all.day.long. I hope you're enjoying the summer bounty this weekend. That looks so yummy! My kids are eating blueberries like crazy lately. Looks great! We were at the farmers market this morning as well and came home with quite a beautiful bounty! I love summer fruit!!!! Summer lunches have been fabulous lately....I've been bringing bowls of cherries and blueberries to munch on during my drives to and from sites at work. Oh, my! That all looks soooo good!! Summer meals are the best!